Europe's top leagues have asked for more time to consider Uefa proposals to allow domestic cup winners into the Champions League. President Michel Platini submitted the proposals at a meeting between Uefa and league and club representatives. Under the proposals, which could begin in 2009, the Premier League's top three and the FA Cup winners would qualify. 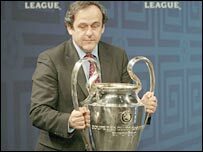 Platini also wants to move the Champions League final from midweek to a weekend. His controversial proposals would also see six places in the Champions League reserved for champions of the 40 lowest leagues in Uefa's 50 member countries. The champions of the top 12 associations will automatically qualify for the group stage. The Uefa president is also likely to meet stern opposition to his proposal to move the Champions League final to a weekend date. Platini said: "At the Champions League final in Athens in May, I was astounded there were no families and children at the match. "This would change if it was played at the weekend." The Champions League and European Cup finals have traditionally been played on a Wednesday evening since the first final in 1956. Platini said he was not concerned that changes or reductions to Champions League qualification might lead to top clubs forming a breakaway competition. He said: "You are not a top club unless there are some bass players. Our system is formed on solidarity. "When clubs wanted to leave before it was a disaster, not just for football, but them as well." Platini also admitted that his proposal that the Champions League final is played in a stadium with a capacity in excess of 75,000 could see Wembley listed more often. The Uefa president again expressed his concern at the number of Premier League clubs under foreign ownership, but admitted there was little he could do about it. Platini said: "Football was based on the identity of clubs and its people and communities. Liverpool was based on Liverpool, and Chelsea in a part of London. "They were not based on the personalities of an American or Russian owner. "There are nine Premier League clubs where the owners are not English, but that is something for your FA or even parliament to sort out, if they want to."